A fire roared on Christmas Eve. For hours, the kitchen filled with the smell of baked bread and stewed meats. Over the stove, a dutiful cook toiled away, seasoning and steaming and broiling in preparation for the evening’s meal. Only the sound of church bells could break the spell. As St. Louis Cathedral sent out its clarion call, the fasting faithful–chefs included–roused with empty, growling bellies to walk the French Quarter towards Jackson Square. The devout crowded wooden pews for midnight mass. The priest took his place at the altar. Songs were sung, the Eucharist given, and then, finally, at two in the morning, it was over. Back the congregants went into December air, through the dimly lit avenues to their homes, where their feast waited in warming pots. a delicious end to their daylong fast. Translated in French, a literal “awakening” of the spirit – one demanding nocturnal tolerances and a generous waistband. In the early part of the 19th century, New Orleans Catholics popularized Réveillon, a holiday holdover from Spain and France. The dinner was cooked during the course of the day and served late in the evening, after worship was over and done with. The food was rich. The booze, in a demonstration of godly fealty, lighter than usual. Turtle soup, oyster gumbo, daube glacé, gumbo, grillades. Anisette, Cherry Bounce, eggnog. European and Creole tastes converged over dinner tables, where they were served by candlelight. People indulged until the early hours, sometimes until dawn. But all parties, some say, must one day come to an end. The Réveillon dinner began its slow march towards obscurity in the 1850s. Recently arrived Americans brought their own traditions to NOLA. By the 1930s, the meal had been mostly forsaken. In spite of changing times and tastes, a few New Orleans households kept the tradition alive. Beloved local chef Leah Chase, born during the times of Réveillon on the wane, still recalls the country Réveillons of her youth, meals of stewed chicken and baked macaroni, glasses filled with wine. But it was not until 1988 when Réveillon regained its broader appeal. Its resurrection means the meal lives on, though in slightly different form. Many restaurants around town, bedecked in tinsel and ribbons, host their own Réveillon dinners throughout the month of December. 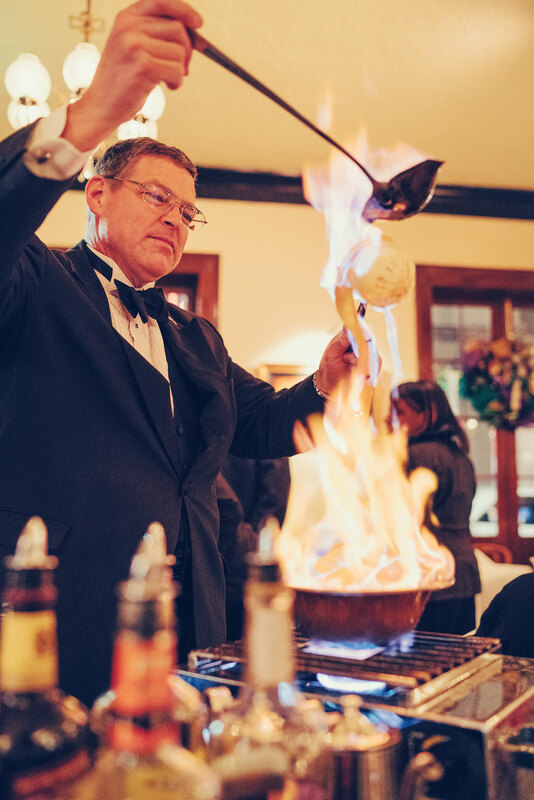 Each dish–from fried oysters at Galatoire’s to courtbouillon at Arnaud’s— is a union of past and present. After many courses and plenty to drink, diners spill into the night, where New Orleans glows white and green and red with Joyeux Noël splendor. Their senses have been well awakened, their hunger sated by those Creole delights of old.